Having talented individuals in STEM careers has allowed for innovation and discovery that is vital to multiple industries and sectors. Without these talented people, we would be pretty stuck, so it’s essential that we continue to encourage young people to explore and develop their interest in these types of professions. 2018 has been dubbed as the ‘Year of Engineering’, a campaign introduced by the UK government as the country faces a serious skills shortage in the sector. A huge number of organisations are involved in the campaign, from companies such as Boeing and Rolls Royce to armed services such as the Royal Air Force and the Royal Navy. The skills shortage is very real in the engineering industry, and this is particularly notable among women. According to surveys, only 23% of those in core STEM occupations are women, so it is important that girls are encouraged to explore STEM when they are young, ensuring they are given the same opportunities as their male counterparts. With this in mind, DiscoverE began the movement, ‘Introduce a Girl to Engineering Day’. This year, this falls on February 22nd and aims to inspire the next generation of females to enter into the engineering profession by providing resources and encouraging educators, parents and engineers to share their knowledge and experience, providing an opportunity for young girls to think like engineers. So, how can you introduce a girl to engineering? This is the perfect opportunity to open a discussion about how engineers can change the world. Ground-breaking inventions from the lightbulb to air travel would not have been possible without the engineers behind them. There have been countless female engineers that have provided us with incredible innovations that have changed the world, from Mary Anderson and her humble windscreen wiper to Stephanie Louise Kwolek and her invention of Kevlar, which is used in bulletproof vests. Without talented women in the engineering industry, we would be missing out on a huge number of inventions and innovations that have helped to shape the modern world. Whether this is at home, in the classroom or at an after-school club, engineering activities can help to show young girls just how exciting this industry can be. Activities can be planned for girls of all ages, so you can help even very young children develop an interest in engineering. You could challenge children to recreate famous landmarks such as Big Ben or the pyramids using Lego or Duplo or design bridges out of straws or lolly sticks. We’ve previously written about engineering activities for the classroom, giving you more ideas on how to make engineering exciting for children. When young people begin thinking about their career prospects, STEM industries can seem a little daunting. However, there are a huge number of career opportunities within the engineering industry, with possibilities and prospects that young girls may have never considered before. At European Springs, we do our part to provide young people with opportunities through our apprenticeship scheme. 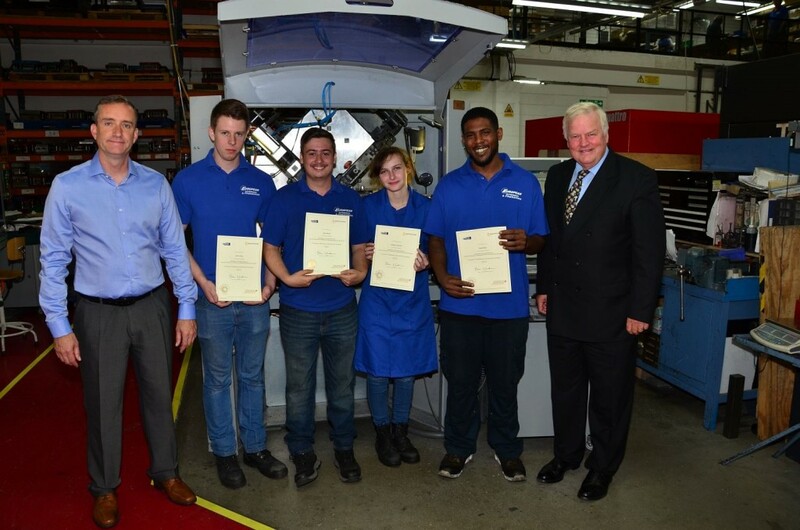 Our latest apprentices were visited by our local MP when he came to award them with certificates that recognise their achievements in Performing Engineering Operations. We even created an infographic that helps to explain a little more about getting into a career in engineering which you can view here. With such a huge variety of possible career paths within the engineering industry, young girls can be encouraged to explore all of their different options. Introducing a girl to engineering now may help to shape the future of the industry as those girls grow up knowing that they have a place in engineering careers. At European Springs, we work to give young people their first step in an engineering career with our apprenticeship scheme. As spring manufacturers, we know just how valuable these young, talented individuals are to the future of our industry. If you would like to find out more about our apprenticeship schemes or vacancies, please don’t hesitate to get in touch with a member of our team by calling 0208 663 1800 or by emailing info.bec@europeansprings.com. Make sure to follow us on Facebook and Twitter where you will be able to keep up to date with the latest news about our apprenticeship schemes and vacancies.